Redondo Beach | Remains of L.A.
Traces of L.A.'s past can still be found, in the kitsch of '50s diners and the decayed glamour of '40s hotspots… and sometimes the food is good, and there are nice people. Tony’s, with its fresh seafood and all, seemed a little pricey for me (that’s definitely going to be an issue, going forward) but the bar, which sits on the roof of the restaurant like an octagonal hat, was said to have amazing views, so I thought I’d check it out. I wanted to walk on the pier anyway. I go to restaurants alone all the time, but almost never to bars, because I don’t drink, and it seems weird to sit at a bar drinking cub soda. It was fine at this bar, though, cause I just said I was there for the view and the bartender smiled said they don’t charge extra for the view and put a bowl of some kind of fancy chex mix next to me. -Eight walls of windows looking out over the Pacific, wooden beams, ceiling fans that looked like they were woven from palm fronds, lots of wood, a peaked ceiling and, for some reason, what I’m pretty sure were fire-fighter hats hanging on each of the eight ceiling beams. Lights in huge colored globes hanging from the ceiling in fishing nets. This was one of the best rooms I’ve ever been in. Categories: Restaurants | Tags: 1952, bar, Beach, club soda, favorite, Los Angeles, monkey, Redondo Beach, Restaurants, view | Permalink. I had a babysitting job down in Redondo Beach today, and afterwards headed over to Eat at Joe’s for lunch. -Bright white walls with bright blue chairs, doors, windowsills, and beams. I color combination I find particularly lovely. -Communal seating at long tables… for someone as (sporadically, randomly) shy as me, this is a bit difficult. When the waitress tells me to sit anywhere I slide into a seat at the far end of a table. Four chairs separate me from the two elderly couples at the other end. I overhear, “my dermatologist is worried about you,” and then they lower their voices. -I have a hard time deciding what I want. I’m fairly hungry, but nothing seems right. Mostly because I’ve decided not to have meat after last nights bbq binge, and being allergic to eggs severely limits my options. I settle on a veggie burger and french fries. Meh. -Free wifi, so that’s nice. 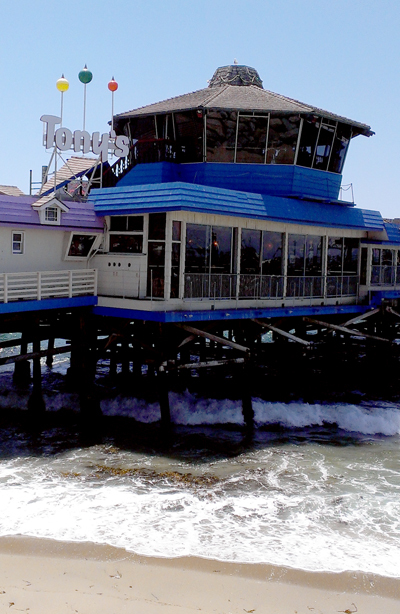 Categories: Restaurants | Tags: 1969, Los Angeles, Redondo Beach, Restaurants | Permalink. I'm a writer and a library clerk. When I can't have big adventures, I try to make small ones. (1947) Langer’s Deli, downtown L.A.
Happy… Anniversary? Birthday? Whatever… Happy!!! (1935) Clifton’s Cafeteria, downtown L.A.
(1947) The Apple Pan, West L.A.
(1924) Original Pantry Cafe, downtown L.A.